The flight to IloIlo was at 4:30 am, so without much sleep we boarded our plane. Honestly, I am clueless with this trip. I had no idea of how the place really looks like and what it has to offer. Maybe, I was tired of being so well-prepared with all my adventures all the time. This past few months I feel like I'm surfing, just trying to float above whatever comes my way. Grace and her mom Tita Josie are my travel buddies in this trip. 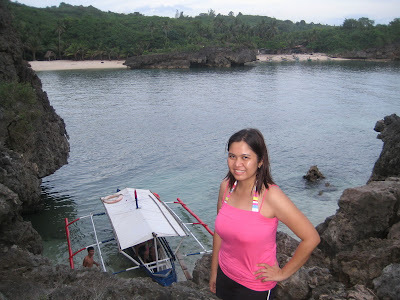 In IloIlo, we took a van, to Parola, boarded a boat to Guimaras which is a few minutes away. It was like Fear Factor when we balanced ourselves on the wood fins to get into the boat. Tita Josie was scared but I thought it was awesome. hehe. When we reached the port, we learned that we took the wrong boat. The good guard assisted us and we rented an FX to reach Alubihod Beach which is in Jordan. The boat to Jordan is located in Ortiz. We travelled from the Buenavista to the southern portion which is Nueva Valencia, it took us 45mins. The main island is adorned with lush deep green trees and well-paved roads. The surroundings islands are composed of lime rocks, mostly tables with trees covering the top. We had a short stop at a mango store, even if it's out of season they have the sweetest Mangoes, and the island is known for that. They do not allow any mango seedlings or fruits coming in from other areas. For our few days stay in Guimaras, it totally felt like summer. The weather, the sky and the fruits. We reached Alubihod early that beautiful Friday morning. We stayed at Raymen's Beach Resort. I had to see the beach and the sea. A few steps away from the resort, the bright clear blue skies greeted me while the crystal clear waters splashig at the light beige sand. The beach is quite empty. 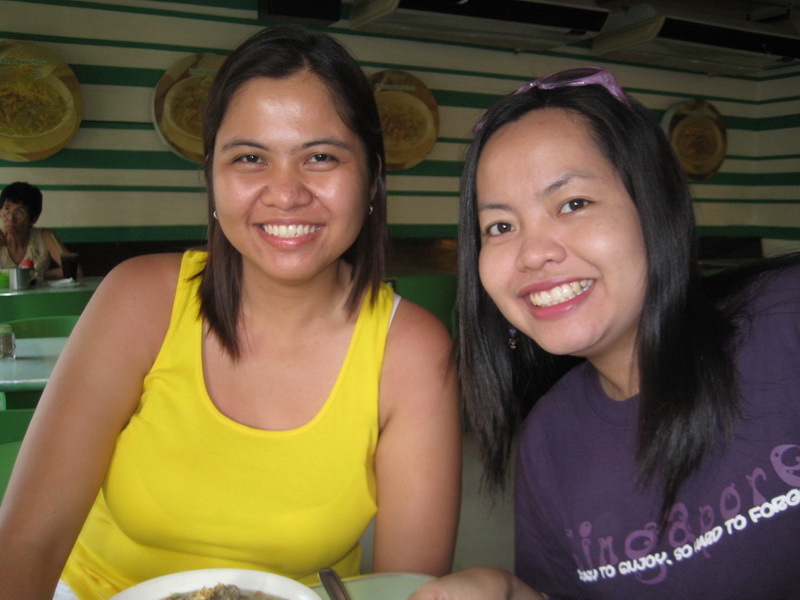 After resting, we ate grilled Bangus and pinakbet. I loved their vinegar which is not too sour. We strolled along the beach and discovered a cove at the end of it. We met a fisherman and bought fresh live lobsters for a minimal fee. That afternoon, we rented a boat for our island hopping. We first stopped at Lawi, at their Pawikan Caring Center. They kept and care for the Pawikans there until they are at a right size, then they are set free. It was my first time to see them up-close. And it was a bit heavy. Guimaras is made out of islets. We passed by a rock formation, they called Fairy Castle, maybe because of it color and shape. It has a beautiful beach as its back drop. One of the islets is called Ave Maria, with clear shallow waters. If ever I would come back, I would love to camp at their empty beaches. On the way to the cave, the sea is calm, we passed by a shallow portion where we clearly saw corals at the bottom. We entered the big opening of the cave, the place wasn't eerie. It has one big chamber, and on the other end there's is also another opening which kept the cave fully lighted. The boatmen swam and floated and they looked like sea fairies. We went to Baras Beach Resort, hidden at one of the islands. It is surrounded by lagoons. We had the opportunity to lounge at the balcony of one of the cottages. It is overlooking the sea/lagoon. It is very nice just to sit back and relax there. If you wanted to get away from it all, you can stay there for a few days. Just the view form the balcony will give you much peace. We passed by Natago Beach Resort which is exclusive. We were able to roam around a bit until the caretaker led us off. hehe. We wanted to stay there before but we used one of the numbers from one website, and we didn't receive any reply from them, so we stayed at the main island instead. We also passed through Isla Naburot, another resort which was shown at Living Asia Travel Channel. 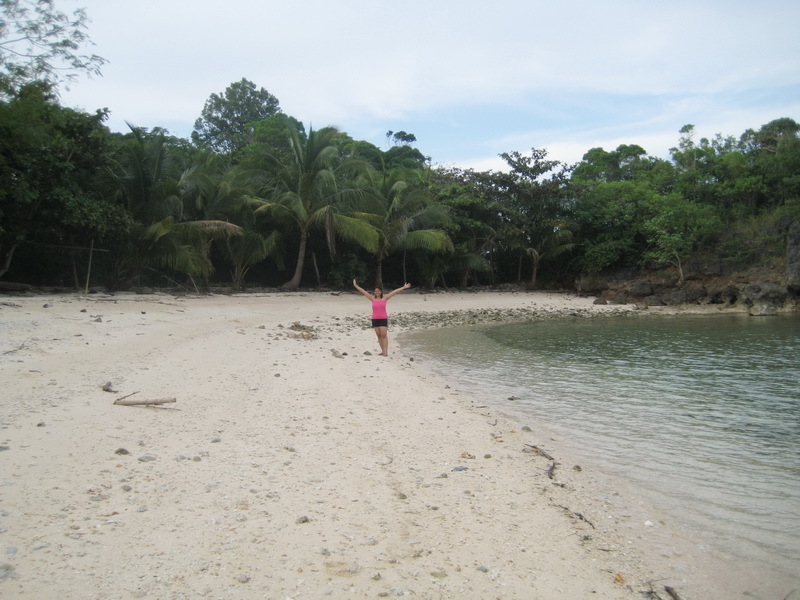 One of my favorite spots, is the "Small Beach" at Tatlong Pulo. At first I was confused because we were sailing and I didn't know where they'll take us exactly, and I doubted that they'll take us there. And they did. It is nice, the sand is fine. I was naming it "The World's Smallest Beach". I even got to rock climb a bit, though the rocks are sharp. It was just my craving for adventure kicking in. If I knew how to swim I should have surely jumped on the other side. The sun has already set on our way back to Alubihod Beach. We had an engine trouble, so we were stuck in the middle of the sea for a few minutes. Tita Josie was scared, but Grace and I did ok. It was very far from the scary boat ride we had in Palawan, where the waves are crushing on the boat and the sea is black in color. With all my travels, Guimaras has the calmest and friendliest sea. That night, we had a lovely dinner. We ate the lobster we bought that morning. On our second day, I woke up early in the morning to watch the sunrise but the beach is facing West. I got to watch the fishermen from far islands, they brought fresh sea foods. They do not use motorboats instead they use ordinary row boats. The caretakers were combing the sand and removing the debris from the water. It was Saturday, so people from other places gather on the beach. When the sun was up, we spent a few hours on the water, but it wasn't enough so we didn't get tanned. Sometimes I would feel itchy, and I've learned that there are several jelly fish. The caretakers dived to remove them. After lunch, we headed back to Jordan Wharf to get to IloIlo. We took a trike, and I was seated on the back. I got to see Guimaras in full view. The mango plantations, the clear skies, the roads with lush trees on both sides. When we reached IloIlo, we stayed at a Four Seasons near SM Delgado. That afternoon, we sampled their famous Batchoy at Ted's. I don't like noodles much but it tasted good. We bought Butterscotch,etc for pasalubong at Deco's.